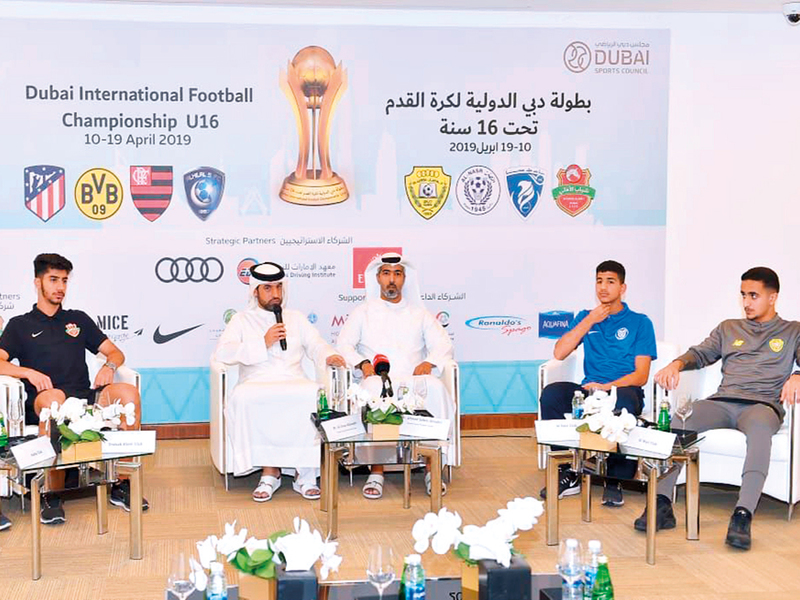 Dubai: Brazil’s Flamengo are confident of successfully defending their title when some of the world’s best talents are on show at the ninth Dubai Under-16 International Football Championship title from April 10-19. Organised by the Dubai Sports Council (DSC) to promote grassroots football and support the country’s young talent, this year’s tournament has attracted the world’s best, with defending champions Flamengo joined by Spain’s Atletico Madrid, Germany’s Borussia Dortmund and Al Hilal of Saudi Arabia. They will be joined by the four Dubai clubs — Al Wasl, Shabab Al Ahli Dubai, Al Nasr and Hatta — at the competition to be played at the Shaikh Maktoum Bin Rashid Stadium in Al Mamzar. The event was announced by Ali Omar, Director of Sports Development, DSC in the presence of Tournament Director Ahmad Salem Al Muhairi and other officials from DSC. Central defender Diego Damaceno, who also wears the captain’s armband for the Brazil U-17 national team, vouched to follow in the footsteps of his teammates of last season. “We are here to play some good football and win this tournament,” Damaceno told Gulf News. “Our team last year showed us how to be champions against some of the best teams in the world, and now it is our responsibility to take this trophy home again. Dubai is a new place for us and the challenge will be to adapt to the playing conditions here. The experience here will be big, but our focus will always be to win and return home,” he added. Flamengo open against Atletico Madrid on Thursday, and one of their strongest opponents will be German side Borussia Dortmund currently at the top of the U16 Bundesliga following their 1-0 win over bitter rivals Schalke before travelling to Dubai. “The emphasis for us will be the experience through which our players can develop both on and off the pitch,” Dortmund coach Karsten Gorges said. “For all our players it will be a challenge to adapt to the conditions here and play the way they have done so far this season. There are some really tough teams from other clubs and it will be interesting to see how they can tap into their mentality to win matches,” he added. Making their fourth straight appearance for this tournament, Dortmund’s best was a runners-up spot in their debut against Saudi Arabia’s Al Hilal in 2016. Since then, the Germans have managed a third place (2018) and a fourth a year earlier. “We have to put more focus on tactical development. We need to play five matches and reach the final first. We have a tough challenge on our hands, and our superior technical strength will see us through,” Gorges confided.